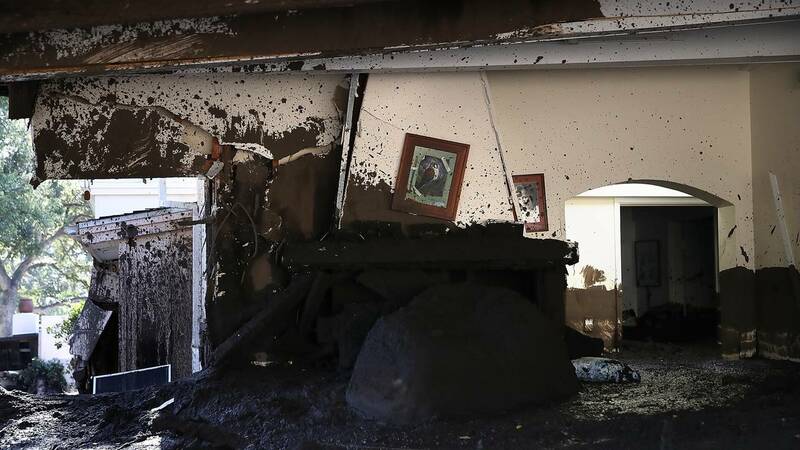 Mud fills a home that was destroyed by a mudslide on Jan. 11, 2018, in Montecito, California. (CNN) - Searchers in California sifted through mud-caked debris Monday for three people missing in mudslides that have killed at least 20 and walloped Montecito, the Santa Barbara County Sheriff's Office said. Hampered by blocked roads, downed trees and power lines, deputies searched for John "Jack" Cantin, 17 and Faviola Benitez Calderon, 28. Lydia Sutthithepa, 2, is also among the missing. Her father, Pinit Sutthithepa, 30, was found dead on Saturday. John "Jack" Keating, 53, who had been listed as missing, was found alive in Ventura, the sherrif's office said Monday. Keating, who is a transient, was in Carpinteria during the storm, not in Montecito as previously thought, the sherrif's office said. He sent the sheriff's office a selfie with his dog, "Tiny." The mudslides came in the early morning hours of last Tuesday, destroying an estimated 65 homes and damaging hundreds of others, the California Department of Fire and Forestry Protection said. The rain poured down on hillsides charred by recent wildfires, which burned vegetation that otherwise could make the terrain more resistant to mudslides. The Thomas Fire -- the largest wildfire in California's recorded history -- burned more than 281,000 acres in Santa Barbara and Ventura counties from early December into this month. It wasn't fully contained until Friday. For days, rescuers searched frantically for the missing after mud and boulders barreled into neighborhoods in and near Montecito, an affluent seaside community east of Santa Barbara. The mudslides demolished homes and left roads impassable. Now, what had been a search-and-rescue operation authorities is a search-and-recovery undertaking. The crews probably won't be hampered by bad weather most of this week. The first chance of rain will come Thursday night to Friday and it is estimated to amount generally to less than a third of an inch, CNN meteorologists said. The cleanup effort is arduous. Santa Barbara District Attorney Joyce Dudley said in a statement Sunday those who "encumber the continuing rescue efforts by unnecessarily entering the affected areas" could face fines and even jail. She noted that the area is west of Sheffield Drive/East Valley Road/Ladera Lane, east of Olive Mill/Hot Springs Road, north of the ocean, and south of the US Forest Service boundary. "Those areas are not only active search areas, but also remain dangerous. Therefore, unauthorized persons who enter those areas will not only interfere with critical and time-urgent search and rescue efforts, but may also become victims themselves." A portion of US 101 -- a major freeway connecting Northern and Southern California -- will remain closed for at least another week through Montecito because of ongoing clean-up and repairs, and rain in the weekend forecast, according to the California Department of Transportation.